Ernie Ball M-Steel Skinny Top Heavy Bottom are a brand new set of electric guitar strings in hybrid 10-52 gauge. 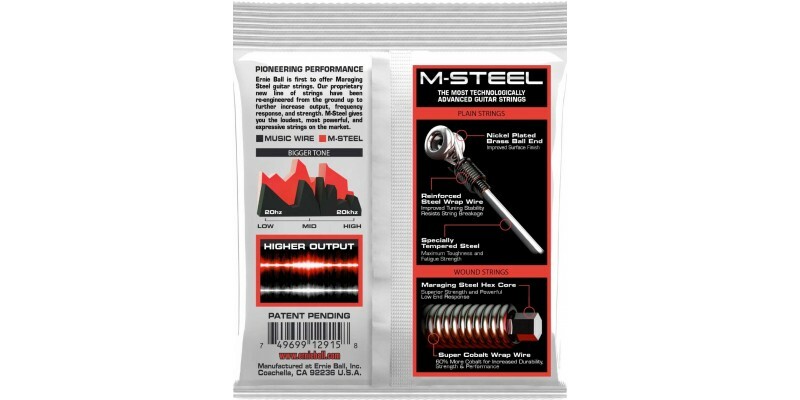 Ernie Ball M-Steel strings use a new alloy which provides higher strength and increased output over normal nickel Slinkys. M-Steel stands for Maraging Steel which is a superalloy of materials used in defence and aerospace industries. Ernie Ball have managed to develop this super strong material in to their latest electric guitar strings. Although stronger, Ernie Ball M-Steel Skinny Top Heavy Bottom still feel great. You get that great Slinky feel and a string far less prone to breaking or slipping. Ernie Ball M-Steel Skinny Top Heavy Bottom strings hold their tuning noticeably better than regular nickel Slinkys. It's not just strength that Ernie Ball M-Steel Skinny Top Heavy Bottom strings provide. You get increased output and harmonics that jump out of the speakers. Ernie Ball M-Steel strings are crisp and bright with a well defined low end response. They're more expressive and fuller sounding than conventional guitar strings. 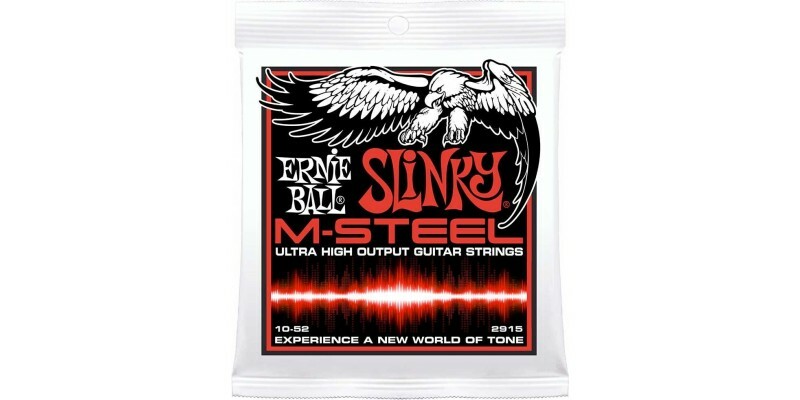 If you normally use Skinny Top Heavy Bottom Slinkys then you have to try the upgraded Ernie Ball M-Steel Skinny Top Heavy Bottom. They'll last longer, sound better and allow you to get the most out of your guitar and setup.